“Dog's Life” proves that what Bill Cockrell's first CD taught us, is true. 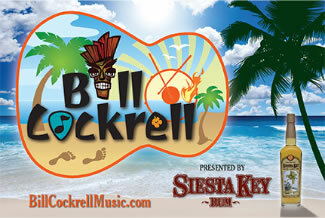 Bill is a powerhouse player in the Trop Rock genre. His original songs and musical ability are nothing short of amazing. Dog's Life” is the best new Trop Rock CD of 2015! When "Aquaholic" came out, that CD found itself in my car player as I drove into Key West and back for work each day, and when I got home, popped it out, and played it on the home player. NOW "Dog's Life" has captured the exact same "good feel" of the sun, water, beach, and LIFE that "Aquaholic" did and that CD finds itself in the same rotation! Bill Cockrell's clear tropical voice and songwriting genius combine to offer a 'Trop Rock' musical gem in his new album 'Dog's Life'. The amazing talents of Bill Cockrell are showcased on this "One of a kind" Trop Rock album. His new release, "Dogs Life" is a must have for all Trop Rockers. Lyle Wilson from Week Days with Wilson Radio A1A The Morning Show. Bill Cockrell follows up last year's terrific trop rock debut with more catchy well written/produced sun drenched originals on "Dog's Life”. "Bill's new CD Dog's Life is a wonderful combination of Beach songs, stories and great fun, not to mention a cool dog song and the CD Cover is a classic!" It's a "Dog's Life" and life is very good indeed! Not surprised Jay Ferguson likes what you did with Thunder Island. This is an outstanding CD that sets the bar for Trop CDs to follow, several notches higher. High Tide was the perfect band for our High School Graduation Party.We live on the water and had a stage in our back yard where High Tide played as the sun set. We were thrilled with their talent, variety of music, professional demeanor and easy going attitude. They arrived early, dressed professionally, provided a fun and upbeat party atmosphere and provided our 60+ guests with great entertainment from 5pm-10pm! I had several guests raving about them and asking for their business cards. I would highly recommend this band for any type of party, large or small. High Tide performed at our wedding and did a magnificent job not only performing but also emceeing the event. They did a great job of playing music he guests liked and were receptive to. Highly recommended for any event. Thanks again guys! They were great! On time, very personable, and sounded wonderful. Everyone who attended had a great time and the song selection was good for everyone at the event. The guys in the High Tide band were spectacular. The event was talked about for days after and everyone had a fantastic time. I highly recommend them for any occasion. Thanks again. you were great..!!! 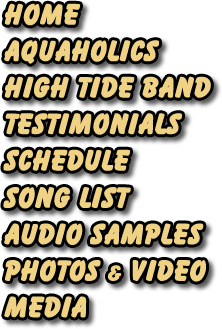 We've used High Tide twice and each time have been delighted with their choice in music selections. They create a fun, tropical, beach themed ambiance to any event suitable for all ages and audiences. No need to worry about questionable lyrics or offensive material here. There won't be any! Totally professional everytime! He even continued to play during a huge rain down pour. Great attitude, great energy and great talent. Would use again! Bill and Carl are great! I would recommend them for any type of event. They played at our wedding reception and everyone young and old were up dancing to their upbeat easy to dance to music. They hit a homerun with our crowd! Thanks again Carl and Bill. High Tide was very entertaining and I would highly recommend them for any event. They were very easy to work with and very professional. High Tide was extremely easy to work with. The quality of the music was excellent. I was very pleased with the band. My attendees loved them! Band was great, very talented and flexible with crowd situation. Would hire again for sure! The music selection was diverse and enjoyed by all attending. Very professional and would not hesitate to hire for any future events. This was the first time I had planned an event of this magnitude but High Tide made it simple. They answered my questions, made sure to ask for information I might have otherwise not given thought to and was very communicative before the event. At the event, they arrived early, engaged the audience when they were reluctant and was able to cater to the whole group. It was a fun night by all thanks to High Tide. I would recommend them in a heartbeat and if I ever need a band again they will be at the top of my list. High Tide is great! From my initial contact everything went smoothly. When I went on line I had no idea about who would be available or who to hire. I liked being able to watch and hear their video prior to contracting for our event. They were in contact with me immediately and I appreciated that. Our rehearsal dinner was attended by 150 people and High Tide made it perfect. Most everyone asked how to get in touch with them for future events. Their sound is very smooth, they are very accomplished musicians/singers and they play great songs - check out their list on the Gigmaster site. Amazing! It was a pleasure to have them at our event and I would highly recommend them to everyone. When the occasion arises - we will definitely call on them again! If they have your date available sign them up fast! High tide was great. In a party where there was a diverse crowd, High tide still managed to get the party started. We had absolutely the best time ever. Everyone wanted to know who the band was and where we found them. They were awesome. Everyone wanted them to stay longer. They made my party a success. I band was great we had a blast. Would hire them again anytime. We chose High Tide for our daughter's wedding because their style of music was perfectly suited for a "Beach Wedding." They were willing to travel from Kissimmee, FL to St. George Island, FL (6+ hours!!) We can not say enough good things about Bill and Carl, they were so much more than we expected!! It rained throughout the whole reception....but our guests said it was the best wedding they had ever been to and High Tide made that possible. Their music had EVERYONE dancing and no one wanted to leave!! Their professionalism was incredible and we all felt like they were our friends by the time the evening was over. GREAT JOB BILL AND CARL!! !